Origins, History, Characteristics of Primitive Native Cultures.  What is Tribal Art? Note: For the evolution of Prehistoric art including chronological dates and events, please see: Prehistoric Art Timeline. For a guide to later works of tribal art, please see: History of Art Timeline. Definition: What is Tribal Art? This is a vague term, with no precise meaning or definition, which is generally employed to describe the traditional art of indigenous natives from tribal societies in Africa, the South Pacific and Indonesia, Australia, the Americas and India. It is sometimes called Primitive Native Art, and includes artworks (and crafts) from all ethnic groups. Tribal art is sometimes extended to include some pre-historic European art (eg. Celtic art), as well as European folk art. In this article, we focus on the best known types of primitive native art from Africa, Oceania, Indonesia, Australia, North America and Alaska. Sadly, the vast majority of these tribal artefacts have perished, or have been bartered away with European explorers, thus surviving examples are confined mainly to stoneworks (sculpture, temples), some earthworks, or rock art. Bronze Age and Iron Age Art. Africa, now regarded by most archeologists and anthropologists as the birthplace of Hominidae, the species to which modern humans belong, has been inhabited for roughly 4 million years, although anatomically-modern people first appeared about 100,000 years ago. The continent is home to roughly 3,000 ethnic groups or tribes. A series of abstract grid-like engravings dated to 70,000 years BCE. Abstract signs engraved on ostrich eggshells used as water carriers, dating to 60,000 BCE. More evidence of modern man's early art, achieved before migrating to Europe. Drawings of animals were found on the Apollo 11 Cave Stones in Namibia (24,000 BCE), while in Somalia, paintings in the Laas Gaa'l caves at Hargeisa were found to contain prehistoric engravings and drawings of men and women worshipping cattle and performing religious rituals. This rock painting, assigned to the era of Mesolithic art, was discovered in the Waterberg area of South Africa, and is believed to date from about 8,000 BCE. These 3,000-year old paintings were found at Ukhahlamba-Drakensberg, South Africa. They portray animals and humans, and are thought to represent religious beliefs. For more about rock painting of this period, see: Neolithic art. African art had a very different function in a very different way of life, from that of European or Western culture. To begin with, it was an integral part of an all-pervading religion. Individual images were representatives, at times even embodiments (though not "idols" to be worshipped, as many Europeans mistakenly used to think) of the vital forces believed to exist in all living matter. Often these images spoke for the spirits of the dead, thus perpetuating the vital essence of tribal ancestry, and becoming identified with the ancestral spirits. Although there are secular aspects to most of the forms used, and some artistic objects are purely decorative and ornamental, in general, African tribal artefacts were created as religious art - for a particular ritual or ceremonial use. This is true not only for masks and figurines but also for carved items ranging from musical instruments, sceptres and ceremonial axes to stools, doorposts and doors. Although the individual craftsman or artist might be recognized and highly regarded as a member of the community, the conception of the thing made as a "work of art" in museum terms was very rare. In no instance is this more clear than in that of one of the most widespread of African art forms - the mask. In European exhibitions, African masks are typically shown emotionally and physically stilled in a glass case, taken out of time, but their true context was in motion, in dance. African Masks have been created in many different forms - some were designed to be worn not on the head but on the arm or at the hip; many were designed as the apex of a whole attendant regalia, of a cloaking garment of straw, twine, bark-cloth, furs - accompanied perhaps by an arrangement of shells, or ivory or metal objects. Transfigured, almost transubstantiated in all this, the masked native relinquished his own personality, and became the vehicle of superhuman spiritual power. When this spirit spoke through the masked dancer, he became its sounding-board and mouthpiece. The mask had to be awe-inspiring, both to satisfy the spirit as a worthy medium for its temporary habitation and to demonstrate its authority to onlookers. Yet the forms which masks have taken across West and Central Africa - while they can be classified, as forms, into various stylistic divisions and subdivisions - are not at all consistently related to their meaning or function. Very similar spiritual concepts could find very different physical expression in different tribal cultures, even if the use of white pigment on a mask, for example, usually denoted a direct connection with the dead. (Note: colours other than black, white and the hue of the wood are not usual.) A lofty forehead seems generally to be associated with wisdom but naturalistic, if simplified, masks which to Western eyes suggest a serene classicism, are found amongst a large range of tribes with very different associations and functions, including aggressive ones. Once the connection of a carving with its original function is broken or lost, it is very difficult to establish the purpose for which it was created. Most African masks are anthropomorphic, though portraiture in any sense is very rare; the faces of the masks may show incisions, reminding us that one important medium of tribal art is the ritual painting or scarring of the living body with traditional patterns. Animal and bird masks also occur (often antelopes or bush-cows); masks still persist in several areas under Islamic influence, but often in forms stylized almost beyond recognition. 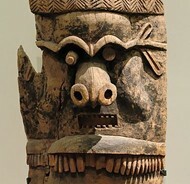 A good deal of tribal ritual is based on initiation into age-groups - into the young men's or old men's "societies" - each of which possesses its separate emblems and cult motifs; many carved figures, as well as masks, are associated with such "societies", and often symbolize patron Gods or deities such as the God of Thunder or the God of Fire. Carved figures are as widespread and popular as masks, and like the latter, relate to ritual, although some tribes - such as the prosperous and settled Baule on the Ivory Coast - made carvings almost as luxury goods. The Yoruba tribe in Nigeria were skillful carvers of figures in the round, and often crowned their usually massive masks with groups of highly animated mannikins, as if a party were in progress. Among the Yoruba, too, as well as in some other tribes, such was the standard and prestige of African sculpture that sculptors could achieve a status and prestige somewhat similar to that of a successful artist in the West. The study of African tribal art is still at an early stage, and the geographical area involved is enormous - the whole of West and Central Africa, with significant traditions, too, in East Africa. Moreover, wood, the dominant medium, is vulnerable to the climate and to termites or white ants, and most other materials used are also perishable - raffia, for instance, or cotton. Both the subject matter and the context of traditional African arts has been altered by the impact of other cultures, not only recently but over a long period of time - Islam and Christianity, for instance, have been present in Africa for hundreds of years. Bottom line: we need to make a much more serious effort to understand the richness and complexity of African art forms. Even some elementary forms of body painting and face-painting are not yet fully understood. Oceania includes four separate regions, or ethnogeographic groupings: Polynesia, Micronesia, Melanesia and Australasia. The tribal art of Oceania means the artistic heritage and traditions of the natives indigenous to these four regions. These natives arrived in Oceania from the Asian mainland in two waves: the first wave of settlers came to New Guinea and Australia in the Paleolithic era of the Stone Age, about 50,000-40,0000 BCE, becoming the ancestors of Australian Aborigines. The second wave, belonging to the Lapita culture (named after the site in New Caledonia where its sculpture and other artworks were first discovered), arrived much later (about 10,000-5,000 BCE), and as soon as its boat-building became sufficiently sophisticated (not until at least 1,000 BCE) began to spread throughout the remote islands of the Pacific region. It was this Lapita culture that eventually influenced most of Polynesia, Micronesia, and Melanesia. Another influence was the Dong-Son culture of Vietnam (c.600 onwards), a major trader within the western Pacific area, whose bronze-works have been found across Oceania. Although each region, indeed each island group, had its own artistic traditions, which influenced its arts and crafts, much Oceanic tribal art was bound up with pagan ceremonies involving the supernatural, spirit-worship, fertility and so on. A relatively wide range of art was, we believe, created (including, body painting, tattooing, painting, sculpture, wood carving, and textile art) though most materials used by artists and craftsmen were perishable. Thus, apart from stone buildings and sculpture, very few examples have survived. Many of those that did, were subsequently bartered with European explorers, in return for trinkets. Polynesia comprises a series of island groups scattered across the central and eastern Pacific. They include Samoa, the Cook Islands, French Polynesia (Tahiti etc. ), Tonga, Hawaii, Pitcairn Island and Easter Island, among others. Polynesian tribal art was practised as part of a culture of religion and magic, which believed that all things were endowed with mana or sacred supernatural power - not just people, but also buildings, stones, canoes, almost everything. Famous surviving examples of Polynesian art include: the stone temples of the Society Islands, Easter island and the Marquesas - all now in ruins, though their proportions, use of stone shapes, colours, textures and so on, display impressive skill in architecture and design; monumental stone sculpture (moai) on Rapa Nui/Easter Island and the Marquesas, exemplifying the use of designs incorporating anthropomorphic figures with bulging eyes and protruding tongues, common to many eastern and remote areas of Polynesia; highly decorated bark cloth in western Polynesia. Melanesia comprises islands in the south-western area of the Pacific, including Papua New Guinea, the Admiralty Islands, the Bismark archipelago, the Solomon Islands, Vanuatu (formerly New Hebrides), Fiji, and others. 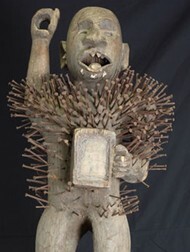 Melanesian tribal art is highly varied, often incorporating exaggerated forms created in connection with ancestor-worship, hunting, and cannibalism. In highland New Guinea, face painting and body art was very important, as were wigs and headdresses. Lowland areas were noted for the paintings and wood carvings of the Sepik peoples like the Abelam and Iatmul. In addition, the curvilinear art of the Massim tribe, exemplified by their prow boards and dancing shields, is also well known, as are the ceremonial Malanggan carvings of New Ireland. Masks, used in elaborate pagan ceremonies and cult processes, were a focus of indigenous art throughout the region. As well as these formal types of arts and crafts, many tribal cultures (eg. in the Solomon and Admiralty islands) had a tradition of decorating a wide range of everyday items. To the north of Melanesia, is Micronesia. This region includes the Marshall islands and some 600 Caroline islands, grouped into four states known as Yap, Chuuk, Pohnpei and Kosrae. Unfortunately, little Micronesian tribal art has survived. Best known examples include the painted bas-relief scenes on the timbers and gables of the men's houses in Palau. In addition, stylized wooden masks and human figures have been discovered in the Mortlock islands, south-east of Truk. Other Micronesian tribal artefacts include painted canoes and carved wooden bowls, while body painting and tattooing was also widely practised. This includes the continent of Australia, New Zealand and their dependent islands. For details of Australasian tribal art, see below under Australian Aboriginal Art. For more information about the style of arts and crafts from the Pacific Islands of Oceania, see: Oceanic Art. Situated between the Philippines to the north and Australia to the south, Indonesia comprises nearly 14,000 islands stretching from Sumatra in the west to New Guinea in the east, including Java, Bali, Kalimantan (central, eastern and southern Borneo), Sulawesi, Maluku, and Irian Jaya (western New Guinea). Because the country straddles the main trading routes between the Pacific and Indian oceans, its art-forms reflect a diverse mix of cultures and religions, including Buddhism, Confucianism, Hinduism, and Islam. Human settlement within the region dates from prehistoric times, but surviving artworks are scant. Indonesian Paleolithic art is perhaps best exemplified by the cave painting in the Karawari Caves, Papua New Guinea (18,000 BCE), while the best examples of Mesolithic art in Indonesia are the painted hand stencils found at the Kalimantan Caves (c.8,000 BCE) in the Sangkulirang area, and the Gua Ham Masri II Cave (c.8,000 BCE) in East Borneo. The influence of Chinese art, (from the late Zhou dynasty and others) was felt from early on, as was the impact of the bronze-based Dong-Son civilization which flourished in Vietnam, in the early centuries BCE. Indian traders were exceptionally active in the area, but it is impossible to give a precise date as to when Indian culture began to exert a significant influence. In any event, the three main religions practiced in Indonesia today - Buddhism, Hinduism and Islam - all arrived from the West. As in Oceania, most Indonesian tribal art, apart from Buddhist and Hindu temples, was carved from wood or made out of textiles, and has long since perished. The best known surviving examples include a group of ancient megaliths and various examples of bronzework after the Dong-Son pattern. The latter includes decorated sacred battleaxes, and large kettle-drums (eg. The Moon of Bali). These drums were cast by a sophisticated lost-wax method and display shallow reliefs of heads of figures engaged in ceremonial activities, or sometimes purely abstract ornamentation. Some are connected with rainmaking cermonies. See also: megalithic art. Another important type of traditional tribal craft practised across Indonesia is textile design, long regarded as one of the region's most varied and unique forms of artistic expression. It includes Batik, mostly practised in Java, and weaving (especially the ikat and double-ikat technique). Famous Indonesian architecture, mainly in the Indo-Java style (3rd-16th century), includes the Temple of Mendut, the Buddhist temple Sewu (9th century), the magnificent Siva temple Prambanan (9th century), the holy bathing places of Jalatunda (late 10th century) and Belahan (mid-11th century), the round Hindu temple of Jabung (10th century) and of course the Borobodur complex (see below). Indonesian tribal art has been classified into two main types: the "monumental" and "ornamental-fanciful". The former is exemplified by the Megaliths of Sumatra and of Nias (a small neighbouring island), as well as many of the objects created throughout Indonesia in association with rites and sacrifices made to ancestors. The ornamental-fanciful mode, is illustrated to some degree in the bronze sculptures but especially in the decoration of the houses of the region, in textiles, and in painted carvings. One important feature common to all Indonesian Tribal Art is reverence for ancestors, which is expressed in a variety of forms. The Nias tribe erected their Megaliths in honour of dead chieftains, while the Toraja people of Sulawesi built cliff terraces containing galleries of standing, wooden effigies of the dead looking out over the rice fields. In Maluku and the north western tip of Irian, there are numerous wooden carved standing or squatting figures embodying ancestor spirits. In some parts of the region, the wooden ancestor figure incorporates the actual skull of the dead person instead of merely a carved head, and the cult of the skull - not a vestige of cannibalism but an extension of ancestor-worship - is widespread. Skulls are collected, treasured and stored in many places: sometimes (eg. among the Batak of Sumatra) in the roofs of houses, sometimes (eg. among the Dayak of Kalimantan) in village shrines. The site of Borobodur in central Java is one of the most extraordinary stone monuments ever made. It is a vast structure, housing over 500 statues of the seated Buddha, but does not seem to have been a tomb, a palace or even an orthodox temple, but instead a profound and intricate expression through architecture and sculpture of Buddhist ideology. It's construction must have required an army of craftsmen and a designer of genius, but there is no record of who built it or why, although it's date is generally assumed to be late 8th or early 9th century CE during the Javanese Shailendra Dynasty (778-864). One of the most amazing things about Borobudur is that it is the culmination of an artistic tradition that seems to have been very short-lived. Western Java had first been settled by Indian traders perhaps in the 1st century CE and Buddhist monasteries were certainly established there by the 4th century, but there is no evidence of any significant undertaking in stone - architecture or sculpture - for a further three centuries. The first known Javanese stone sculpture, which is Hindu, dates from the early 8th century, hardly one hundred years before Burobudur. Burma, the mountainous jungle link between the Indian and Indochinese sub-continents, was originally settled (c.500 BCE) by the Tibetan-Burmese Pyu people, and then - two centuries later - by an Austro-Asiatic race known as the Mons. Typically, most surviving examples of Burmese tribal art consists of monumental sculpture, most of which is Buddhist. Since about the seventh century BCE, the country was effectively divided between two sets of tribes mentioned above, the southern Mon and the northern Pyu, both of whom practised Buddhism. Following the fall of the Pyu capital in 832, the north was infiltrated by Burmans who brought with them the cult of Nats, a mixed bag of spirits and beings including nature spirits, ancestors and ghosts. This cult together with the Buddhism of its predecessors duly merged into a hybrid religion which is still a force in Burma today. An artistic tradition of painting and sculpture was established in the time of the Mon and Pyu, and King Anawratha who, in the 11th century established the capital of the United Burmese Territory at Pagan, employed Mon artists in large numbers. Palaces, temples and shrines occupying several dozen acres sprang up, richly ornamented with painting and painted terrocotta sculpture which is still there in Pagan in some quantity today, since in 1286 the city was sacked by the Mongols and virtually abandoned. Aside from the ruins at Pagan and other sites, the heritage of Burmese tribal art consists of a few small medieval bronzes, of high quality, and quantities of carvings of indeterminate age: there has been little variation in style. Figures tend to be simplified and generalized, enacting ledgends mostly of Buddhist legend in elegant postures, reminiscent of The Dance; the supreme quality of Burmese art lies in its airy spirituality and inspired decorative finese. Ancestors of the aborigines and other indigenous native peoples of Australasia were part of the same wave of settlers who arrived in Oceania from the Asian mainland during the Pleistocene period of the Paleolithic Stone Age, around 50,000-40,0000 BCE. Although the details of their culture are sparse, according to recent archeological research on the Australian mainland, they began practising forms of tribal art almost immediately. Aboriginal art of Australia encompasses a wide range of types and media, including body painting, rock painting, bark painting, rock engravings, standing stones, carving and sculpture, as well as decorative embellishments on tools and weapons. This primitive art form is exemplified by the Yolngu people of Arnhem Land, who cover their bodies in elaborate and exquisite designs, featuring delicate cross-hatching and dotted line-work, in preparation for ceremonial events and dances. These forms were typically the first types of prehistoric art to appear. See Kimberley rock art, for instance, where rock markings and hand stencils were some of the region's earliest parietal art. The most widely practised Aboriginal tribal art form was rock painting, examples of which can be found throughout Australia. It includes such types as: X-ray art pictures of animals and humans (eg. see Ubirr rock art in Arnhem Land, Northern Territory), within whose outlines were marked the skeletons of subject; dot-painting in which intricate patterns were created using dots; and stencilled images, such as those produced by a hand or palm print. Numerous other styles of rock painting have been discovered, including the distinctive Bradshaw paintings in the Kimberley region of Western Australia. In this type of tribal painting, the artist paints his unique signature designs on pieces of flattened tree bark. It has subsequently become a popular and highly regarded form of contemporary Aboriginal art. Australia contains many examples of petroglyphs (a fancy name for rock carvings), such as those at Terrey Hills, New South Wales; the Murujuba Peninsula and Dampier Archipelago in Western Australia, which features drawings of extinct Stone Age animals such as the Thylacine; and the Panaramitee engravings in Central Australia. For more about ancient petroglyphs in Australia, see Burrup Peninsula rock art (c.30,000 BCE). Stone arrangements, another form of Australasian tribal art, encompass large and small stone circles, not unlike Stonehenge in England, arranged in connection with ceremonial or ritualistic events. The ancestors of American Indians crossed the Bering Strait from Asia during the Pleistocene epoch of the Stone Age. The Americas and Australasia were in fact the last two major land masses to be populated by prehistoric man. A defined Indian culture began to emerge around 9,000 BCE, separated into the Paleo-Indian buffalo-hunting culture of the West and the Great Plains, and the poorer Desert culture tribes of the western Basin-Range zone. Native American Indian art has been shaped largely by the nomadic, hunter-gatherer nature of the former, and the slightly more static but impoverished environment of the latter. Availability of resources - wood, wicker, metal, animal bone, clay, cotton, and so on - was also a determining feature in the development of regional artistic traditions. See also: Pre-Columbian art (up to 1535 CE). In the south-western region - which included tribes like the Hohokam of southern Arizona, the Ansazi of northern Arizona and New Mexico, and the Mimbres of south-west New Mexico, as well as the Zuni, Navaho and Hopi peoples - traditional architecture was exemplified by the amazing multi-storied structures at Pueblo Bonito in New Mexico. Tribes were also masters of weaving, pottery making (typically linear or geometric in design) and fresco painting. In addition, many of the large traditional underground religious chambers (kivas) were decorated with brilliant murals. There was no notable monumental sculpture, but certain tribes specialized in particular art-forms: the Hopi and Zuni tribes produced carved and painted cottonwood dolls, while the Zuni and Navaho favoured silver jewellery inlaid with turquoise, and the Hopi produced complex costume fabrics. Sandpainting (also known as dry painting) was developed by southwestern Native Americans (notably the Navajo). Essentially a traditional healing ceremony, the "artist" is a Medicine Man who "paints" by sprinkling different coloured sands onto a buckskin or cloth tarpaulin. The "paint" comprises naturally coloured sand, mixed with white gypsum, yellow ochre, red sandstone, black charcoal, charcoal mixed with gypsum to produce blue, as well as other colouring materials such as corn meal, flower pollen, powdered roots or bark. Once the medicine man has finished "painting", the patient sits on the completed work, whereupon the medicine man calls upon the illness to flow into the sand. Once the ceremony is over, the now-toxic sand is disposed of. For more, see Sand Art. Traditional Indian culture of this region developed strictly tribe by tribe, and was noted for its rich textile art, as well as its famous earthworks, known as "effigy mounds", representing animal shapes. Tribal art also included sculptured stone pipes, polished ornaments of stone and copper, but little wood-carving, except carved bowls. Art designs varied from ultra-realistic to abstract. In prehistoric times, the most exciting region of Native American Tribal art was the central-south and south-east. It produced finely carved shells, intricately decorated clothing ornaments, along with bird and animal pipes. However, it was most renowned for its wonderful ceramics, produced despite a low-quality clay. Pottery works (water bottles, large burial jars, bowls, urns and many other items) were created and decorated in a wide range of designs, including floral and geometric, for ceremonial, religious and personal use. One famous masterpiece of tribal art pottery from the south-east is the Middle Mississippian diorite-stone bowl in the shape of a crested wood duck. In California, home to the Cherokee, Pomo, Hupa, Yurok and Karok tribes, Native American art was exemplified by basketry. Indeed, no other people in the world have produced such a wide variety of superb basketry. Weaves were so tightly configured that they produced watertight containers. Other tribes of the region, like the Chumash, Koso, Mono-Paviosto and Washo, were no less skilled. The Indians of the Northeast, notably the Iroquois, were celebrated for their False Face Society masks, porcupine quillwork, beadwork, wooden bowls, and woven wampum belts. Pottery was also practised, as was weaving and basketry, but none was of a particularly high quality. The great tribal art of the Northwest was sculpture, particularly wood-carving. Living among the great American cedar and spruce forests, Native American carvers produced the greatest range of woodwork of any of the Indian tribes. Totems, small wooden figures, and masks, carefully painted and often inlaid with stones and abalone shells, were among the most common forms of hand-carved sculptures. The totem pole in particular exemplified the local culture. It was not a religious object, and was never intended to be worshipped. Instead, totem poles were a type of "historical document", which recorded the social position, wealth and relative importance of the person who paid for the pole - typically an individual village chieftain or nobleman. Northwest Indians were also the first Native American Indians to master metalcraft. Iron and copper (some of it obtained from whaling ships) were made by craftsmen into fighting knives, masks and also tools. Dedicated to the history, culture and arts of the native peoples of the Western Hemisphere, the Smithsonian's National Museum of the American Indian was opened on the National Mall in Washington DC, in September 2004. It houses the collection of the former Heye Foundations Museum of the American Indian, which numbers over 800,000 objects, as well as a photographic archive of 125,000 images. A college and gallery devoted to indigenous American Indian tribal art, The Institute of American Indian Arts is located in Santa Fe, New Mexico. Established in 1962, it provides a range of undergraduate degree courses in creative writing, visual communications, studio art and museum studies. Alaskan tribal art - or Inuit art - describes artwork produced by the Inuit people of the Arctic, previously called Eskimos. One might imagine that the creation of art would be a pointless luxury in such a harsh environment with so few raw materials. Not so. The Inuit have produced some of the most imaginative and exceptional Indian art on the continent of America. Inuit carvers employed walrus/whale ivory/bones, or reindeer antlers, coloured with charcoal, to create intricate figures, and wood to produce their famous masks, maskettes and amulets, which were used for dances and ceremonial occasions. These forms derived from the Dorset culture, which began about 600 BCE. This was superceded about 1000 CE, by the Thule culture during which objects such as cooking pots, ornate spears and harpoons, as well as clothing ornaments, combs, buttons and needle cases became popular. Like Viking art, Eskimo art reflected the needs of a nomadic culture. All art was strictly portable, often created on a miniature scale. European collectors and artists started to develop an interest in what was then called primitivism/primitive art - usually the art of black Africa - from the mid-19th century onwards, as more and more expeditions returned with tribal artefacts. This interest was also fanned from about 1855 onwards by the fashion for Japonism. By the end of the century, major artists like Vincent Van Gogh (1853-90), and Henri Matisse (1869-1954) had become strongly influenced by tribal art, while Paul Gauguin (1848-1903) had actually experienced it in situ, in French Polynesia. They were followed in the mid-1900s by Pablo Picasso, whose seminal early Cubist work Les Demoiselles d'Avignon, painted during his epoque negre, displayed clear signs of African masks, and also by the art dealer Paul Guillaume. Since then, the influence of African and Oceanic art has permeated all forms of Western fine art, notably painting, plastic art (like sculpture and ceramics) and many craft disciplines.